STEEL WILL 632S Onrush Serrated Tactical Folding Knife FREE SHIPPING! 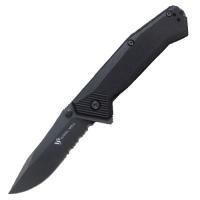 The Onrush 632S version features a serrated blade. The Onrush may be opened by its thumbstud or by its flipper, which enlarges the finger guard in the open position. Similar to the Bruiser, the Onrush features a glassbreaker, which is made from a separate piece of hardened steel. Made in Italy. ©2002-2019 CopsPlus.com: STEEL WILL 632S Onrush Serrated Tactical Folding Knife FREE SHIPPING!